This emergency appeal has just been put out by Save the Children. December 7th, 2015 – As a result of the worsening food crisis in Ethiopia caused by a severe drought related to El Nino, the Government of Ethiopia has announced today that a staggering 10.1 million people will face critical food shortages in 2016, including more than *5.75 million children. An estimated 400,000 children are now also at risk of developing severe acute malnutrition in 2016, which can lead to stunting, and physical and mental delays in development. “The worst drought in Ethiopia for 50 years is happening right now, with the overall emergency response estimated to cost $1.4bn, so the world leaders meeting at the Paris climate talks this week must take the opportunity to wake up and act before it’s too late,” warns John Graham, Save the Children’s Country Director in Ethiopia. 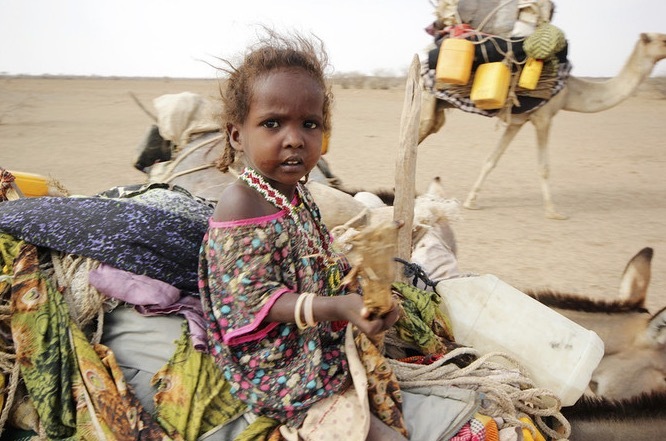 “Months before the devastating drought and subsequent food crisis of 2011 hit the poorest and most vulnerable communities in Somalia, Ethiopia and Kenya, the world clearly saw the disaster approaching but did not prevent it – tragically, history is set to repeat itself in 2016 unless the international community acts right now. “According to recent reports combining UN data on the cost of providing life-saving support with evidence on the economic impact of drought, an early response could save an estimated $8 million per day. Money isn’t wasted by investing early, in fact it helps to ensure investments in resilience and risk reduction are maintained. We simply cannot sit back and wait until the situation has reached crisis point this time,” he adds. The Ethiopian government has already committed an unprecedented $192 million to help combat the crisis as part of a huge national effort mobilised to mitigate the impact of the relentless drought, but more help is urgently needed from donors and the international community to support the government to stop the situation from deteriorating further. Drawing on a joint-agency report from 2012, A Dangerous Delay, Graham reiterates that, in the long term, the answers lie within developing countries themselves, including supporting local food production and markets, protecting the poorest and most vulnerable, making food affordable, and ensuring a strong national response to impending crises. The failure of the Belg rains earlier this year, as well as the usually reliable Kiremt summer rains, has had a devastating impact on Ethiopia’s harvest, with the next small harvest not expected until June 2016. In addition, the significant gains made in food security, education, and health over the years are in jeopardy in some parts of the country. Save the Children is working in over 70% of the worst-affected districts in Ethiopia, providing food, water, medicine and crucial support to families who have lost their incomes. The agency’s immediate focus is increasing food aid and water trucking, and is also training community-based health workers to treat malnutrition, intervening to save livestock and crops where possible, and supporting families that have lost their livestock and livelihoods with cash-for-work programs. Next Next post: If this drought is worst in 50 years what is happening in Eritrea? Ethiopia is main problem is their leaders. They are not managing Ethiopian resources correctly and also they should make peace with Eritrea by evacuating the Sovereign Eritrean teritory. They should abide by rule of law. They spending millions of dollars on defense by occubying Eritrean territory. They should spend their money on their starving people. The west should make pressure on Ethiopia to make peace with Eritrea.